“The Third World War is on the way, and Iran will be the starting point in that war, in which Israel will have to kill as many Arabs as possible and occupy half of the Middle East,” Kissinger said in an interview with the DailyScape. “We have told the US military that we are forced to occupy seven countries in the Middle East because of their strategic importance, especially because they contain oil and other economic resources. There is only one step left, which is to strike Iran,” he said. “The drums of war are already ringing in the Middle East, and the deaf is the only one who does not hear them,” Kissinger said from his point of view, Israel would control half of the Middle East. Kissinger noted that American and European young people have been well trained in the fighting in the last ten years, and when they are ordered to go out to fight crazy ones, they will obey orders and turn them (Muslims) into ashes. Kissinger confirmed that he had a great dream at the moment that his vision of events was realized. For those who do not know Henry Kissinger, the former Secretary of State and one of the most famous emperors of world rule and the architects of the new world order, he was born in 1923 in Germany to a Jewish family. Did one of the world’s most terrible dictators, Adolf Hitler, really commit suicide in 1945? According to the official version of events (by Allies of World War II against Germany), Hitler and his wife Eva Braun committed suicide in their underground bunker on April 30, 1945. Hitler died of a gunshot to the head, while Braun consumed a cyanide pill. Their bodies were then taken outside and burned by staff, before being deposited in a shallow grave. But according to a report in Huffington Post UK, one Abel Basti of the Instituto Florencio Varela in Argentina, claims that the United States helped Hitler escape to South America so that he would not fall into the hands of the Soviet Union. The historian believes Hitler exited the bunker beneath the Chancellery in Berlin via a tunnel, which took him to Tempelhof Airport, from where a helicopter took him to Spain. From Spain, he traveled to the Canary Islands and then to Argentina in a U-boat. Hitler spent a decade in Argentina before moving to Paraguay, claims Basti. The former Fuhrer (Hitler) died there on February 3, 1971. Basti further claims that Hitler was buried in an underground bunker, which is now an elegant hotel in the city of Asuncion. About 40 people attended the burial. Basti’s theory of Hitler’s escape and route to freedom has been backed by veteran CIA agent Bob Baer. In 2009, American researchers claimed that DNA tests on a fragment of Hitler’s supposed skull showed that it actually belonged to a woman. The skull with a hole in it was supposedly taken away by the Russians and went on display in Moscow in 2000, where it was considered irrefutable proof of Hitler’s suicide. The only bodily remains of the Fuhrer which have been accepted as authentic, is a piece of his lower jaw possessed by the Russians. Recent investigations for a television show by former CIA operative Bob Baer and Tim Kennedy, who were involved in capturing Al Qaeda leaders Osama Bin Laden and Abu al-Zarqawi, has opened up the possibility for an alternative version of history. A document contained in 14,000 declassified documents, which sourced from British intelligence claimed that just a day before April 29, 1945 (the assumed day of Hitler commiting suicide), he was flown out of Berlin by Luftwaffe pilot Captain Peter Baumgart. Also, investigators unearthed an earlier unknown fifth exit from Hitler’s bunker, which lead to a space large enough to be a makeshift runway. Another document claimed that an SS officer had spotted Hitler in Denmark, before changing planes to his destination, according to the report. Evidence of a military-style compound in Argentina where Hitler may have stayed, was also discovered in the investigation. A group of 15 soldiers led by a Major were on their way to the post in Himalayas (Pakistan) where they would be deployed for the next 3 months. The batch who would be relieved waited anxiously. It was cold winter intermittent snowfall made the treacherous climb more difficult. “If someone could offer a cup of tea”, the Major thought, knowing it was a futile wish. “Sir, this is a tea shop and we can make tea… We will have to break the lock”, suggested one soldier. They were in luck, the place had everything needed to make tea and, also, packets of biscuits. The solders had tea biscuits and were ready for the remaining journey. The major thought, they had broken open lock and had tea biscuits without the permission of the owner. They’re not a band of thieves but disciplined soldiers. He took out a Rs1000/- note from his wallet, placed it on the counter, pressed under sugar container, so that the owner can see. The officer was now relieved of his guilt. He ordered to put the shutter down and proceed. Three months passed, they continued to do gallantly in their works and were lucky not to lose anyone from the group in the intense insurgency situation. It was time for another team to replace them. Soon they were on their way back and stopped at the same tea shop which was open and owner was present in the shop. The owner an old man with meager resources was very happy to greet 15 customers. All of them had tea and biscuits. They talked to the old man about his life and experience specially selling tea at such a remote place. “Oh, Baba, if God is there, why should He keep you in such poverty ?”, commented one of soldier. The faith in his eyes were unflinching. 15 pairs of eyes met the eyes of the officer and read the order in his eyes clear and unambiguous, “Keep quiet”. The officer got up and paid the bill. He hugged the old man and said, “Yes Baba, I know God does exist. The 15 pairs of eyes did not miss to notice the moisture building up in the eyes of their officer, a rare sight. Kashmir Day is celebrated by people of Jammu Kashmir every year on October 27 by holding protests. Here I describe only one. 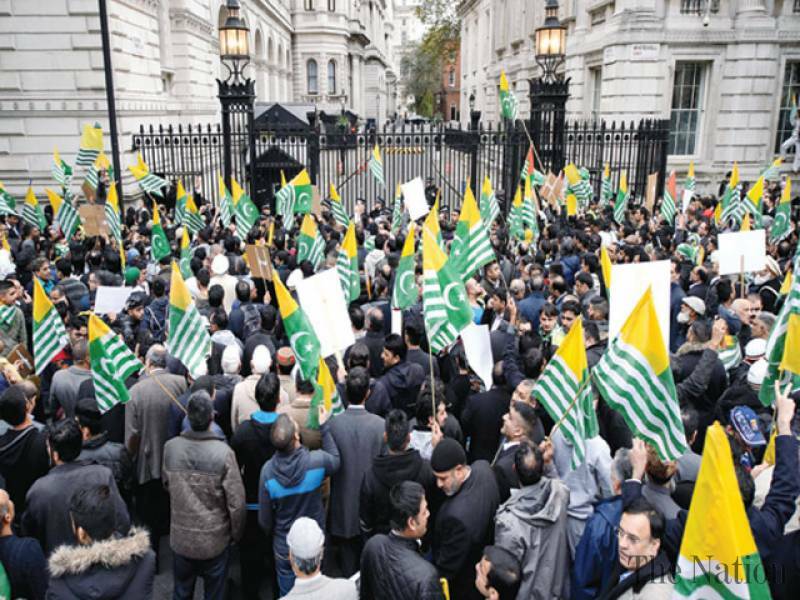 Thousands of people attended a Million March for Kashmir’s right of self-determination in London on Sunday, 27 October, 2014 to show solidarity with the people of Indian- occupied state in their decades-long struggle. A large number of people supporting the Kashmir cause came out on the streets of London to draw world attention to the Kashmiris’ troubles who have suffered a lot at the hands of Indian occupation forces in their quest for freedom. Thousands of Kashmiri people have been killed in decades of Indian brutality. Many people had travelled from several other cities in Britain for the event marked by placards with anti-India slogans. The participants numbering thousands chanted slogans like ‘Kashmir bane ga Pakistan’, ‘We want Freedom’ and ‘Go India Go’.The March, which was also a protest against human rights violations by Indian troops in the Occupied Kashmir, started from London’s Trafalgar Square and concluded at 10 Downing Street – the official residence of British Prime Minister David Cameron. Towards the end of the March, the protesters submitted a memorandum to the British government seeking an early resolution to the Kashmir dispute in accordance with the aspirations of people of Kashmir. Though billed as a ‘Million March’, the strength of the rally was nowhere near that mark. Member UK Parliament and British House of Commons Kashmir Committee President Andrew Griffiths also addressed the gathering. In a statement, Hurriyat leader Syed Ali Shah Geelani declared London Million March a much needed step. He said it is to give world a message that terrorism has no direct or indirect link to the Kashmir Liberation Movement and the people of Kashmir were struggling for their genuine right.Some unconfirmed reports suggested that India had asked the United Kingdom not to allow this march in London but the British government refused the request.